they also could now observe them underwater. So in late summer 1972, while diving to collect subtidal algae etc, a common seal, phoca vitulina L, was observed. During the period 1980-1980 several seals where counted from aircraft. and again in 1986 about 30 adults were registered. no ears visible; long muzzle; nostrils parallel. 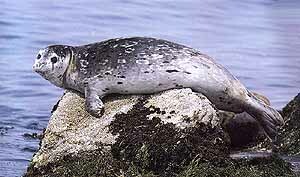 Head/body length: average for males 207cm; for females 180cm; flippers about 25cm. 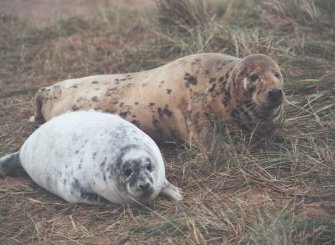 as many as 34 puppies were seen on land as 16 adults in the sea during one overflight. on December 13th, 3 white pups and about 70 grown ups were basking on land. Grey seal pups on the northern sandy spit of the island of Surtsay. The picture is taken by Erlingur Hauksson from an aircraft on October 19th 1986.
scorpions can be found there to eat. 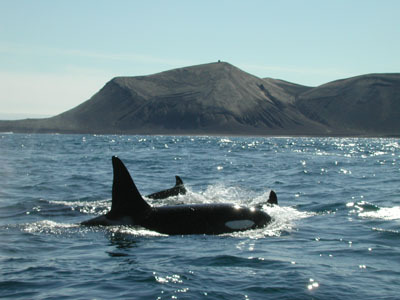 Around the Westman Islands, Killer Whales are often seen near Surtsey. to the year 1997 the number of different species totalled 76.
the island, but are opportunists that have been found sporadically over the years. Some of these species have only been found once after their discovery like e.g. One of the species, hincksia recurvata, has not been found elsewhere in Iceland. 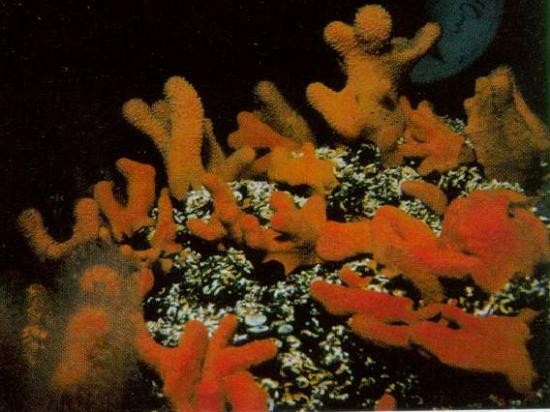 zone ever since it was first found in 1966.
and plants of up to 9 years have been collected on Surtsey. at the east coast of Surtsey, in July 1997. The highest plants measure about 1.5 m in stipe length. found at all depths in all years and generally had high cover. In the sublittoral zone the most conspicuous herbivores observed were echinus esculentus, strongylocentrodus droebachiensis, lacuna vincta and padina pellucida. 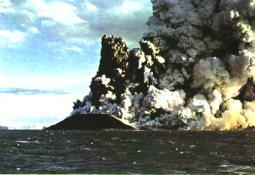 of Surtsey in July 1997. 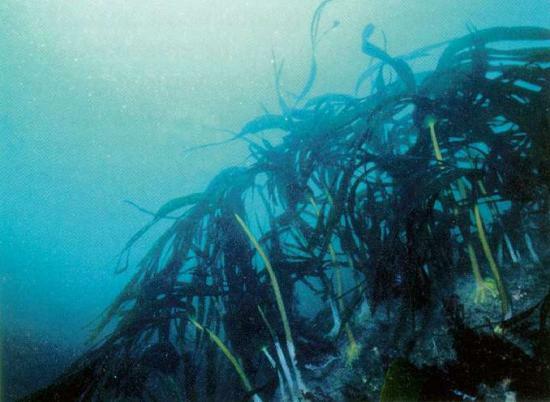 Species appearing in the photo are the seaweed species delesseria sanguinea, phycodrys rubens, lomentaria orcadensis and juvenile alaria esculenta. 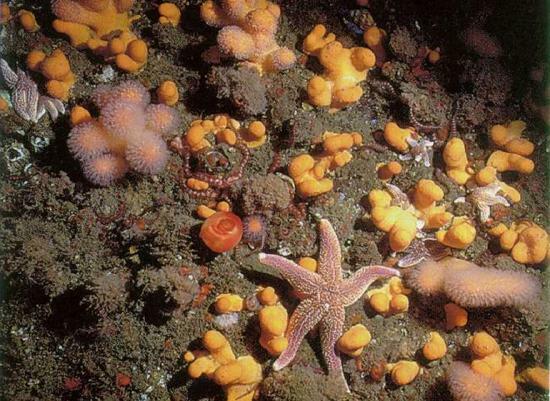 Prominent animal species are sea star, asterias rubens, sponge, grantia compressa, mussel, mytilus edulis and hydroid, tubularia larynx. In the year 1997 or just before, another new record, not expected in Surtsey, was omphalophyllum ulvaceum. 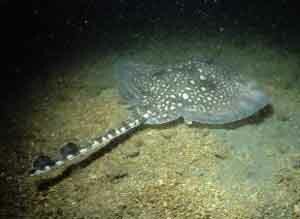 It was found in the sublittoral zone at the depth of 10m. in northern Iceland. It has also been found in Greenland and elsewhere in the Arctic. 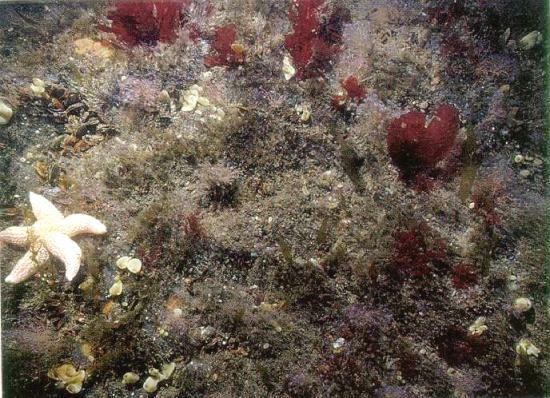 This species was recently also found on the French side of the English Channel. 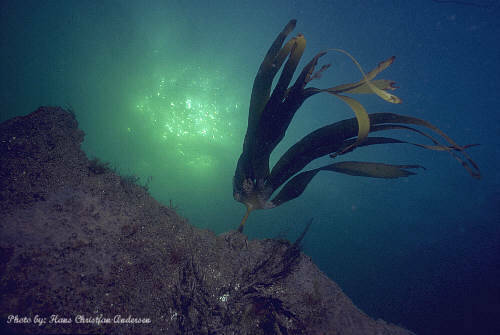 which the cover decreases rapidly with depth and is down to 1.6% at 30 m.
Mermaid purses from Surtsey covered with seed. 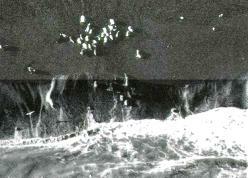 several of those capsulated eggs drifted ashore on Surtsey. Carex, from the Latin, "sedge, reed grass, rush"
lasiocarpa, from the Greek, lasios (lasios), "shaggy, woolly, hairy", and karpos (karpos), "fruit"; hence, "woolly fruited"
Common Name, from the distinctive seedhead, the "woolly fruit"
The chitinous material of the purses was somewhat shedded into thin bristles which the seeds stuck to. Some of the seed were hairy which even increased the adhesion effect. Except for one infertile fruit of carex (see yellow frame above), the seed found attached to the mermaid purses were all of grass species, which are common in Iceland. A total of 131 seeds belonging to about 10 different species were collected.